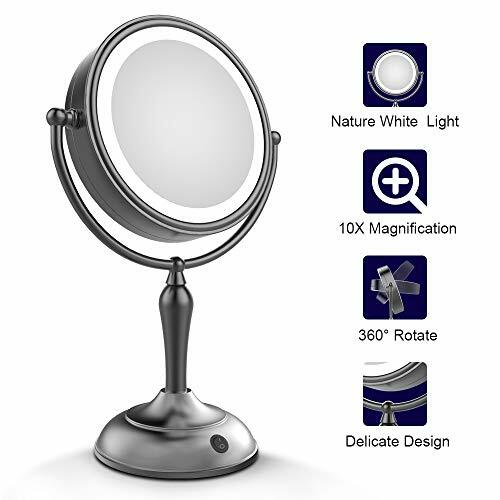 This magnifying mirror is a useful tool for women makeup application and men's shaving since it is featured by 10 times magnification on one side and regular on the other side. It allows detailed work such as eyebrow tweezing, contact lens placement and mascara application. It is useful to observe pores and blackheads. This magnigying mirror provides clear vision for any grooming or make-up use. ADJUSTABLE SWIVEL TO DISCOVER YOUR BEAUTY FROM DIFFERENT ANGLES - Smooth 360 degree free rotation can be adjusted and fixed to any angle for viewing. Non-slip stand allows you to place this vanity mirror at your ideal angle so that your whole face is always in view. It is a perfect tool for makeup application and hair styling. You can adjust it to an optimal angle for the ease of use during your daily beauty and grooming routine. PORTABLE, COMPACT AND ELEGANGT DESIGN - The elegant and classic design of this LED makeup mirror adds a touch of luxury to your bathroom or any other vanity area. Its light-weighted design and battery powered feature make this vanity mirror perfect to carry around. It is great and chic as a tabletop vanity mirror. The compact design of this double sided LED mirror only takes up little space and allows it to be a wonderful travel companion that keeps you looking flawless wherever you are. If you have any questions about this product by Mirrormore, contact us by completing and submitting the form below. If you are looking for a specif part number, please include it with your message.